Good morning! My first profit target was hit during the morning European trading session and after making an adjustment to my stop on my remaining position to breakeven, AUD/USD rallied after weak US GDP data to close out my remaining position. That’s probably it for me for the week as I head home for the holidays. It’s been a wild few months and I’m so anxious to hang with family and friends and get grounded once again. Don’t worry, it’ll only be for the weekend, and I’ll be back next week to see if we can pull more pips out of these crazy markets. Thanks for checking my blog out, travel safe, and happy holidays! Greetings! It’s a new week in Forex trading, but a short one here in the US as we get the holiday season started. 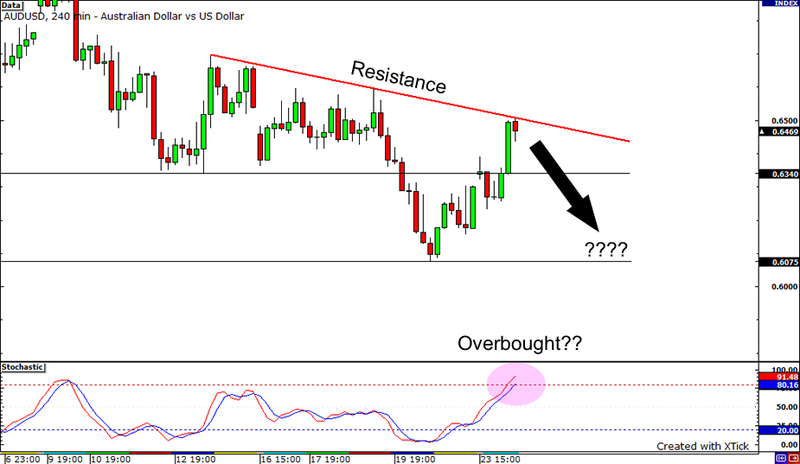 I thought I’d take another crack at AUD/USD as today’s price action may have brought me another shorting opportunity. On the chart, I have a simple trendline drawn to mark the downwards slope and it looks like the pair is touching again. Will it find resistance? Maybe so, especially with stochastics indicating today’s rally may be over done. Today’s rally was based on risk appetite as the news of a Citi bailout was released this weekend and on weak US housing data. Also, US president-elect Obama held a press conference today announcing his economic team, sparking a little more confidence as well.